A forty-eight-hour strike Monday called on subcontractors to clear the way for Minneapolis and St. Paul retail janitors to form a union. Striking janitors in Minneapolis. Photo by Trang Do. The chemicals Maricela Flores uses to clean a Minnesota Target store’s floors are powerful enough to cut through her skin. Yet Flores says the contract cleaning company she works for, Carlson Building Maintenance, failed to give her protective gloves until after she participated in a February strike organized by the local labor group Centro de Trabajadores Unidos en Lucha. Carlson, which did not answer requests for comment, fired Flores soon after the strike. Although management never said so, rumors at work indicated the action was likely retaliation for her involvement with CTUL. With the group’s help, Flores returned to her job. The brush with unemployment would not be enough to quell her fight. Now Flores is striking again, this time demanding that her employer and other contractors stop retaliating against store cleaners for organizing with CTUL. Approximately thirty workers from twenty-five mostly Target retailers walked off the job Monday. Throughout the day on Tuesday, around 250 protesters picketed outside Target’s flagship downtown Minneapolis store. Several workers will fly to the corporation’s annual meeting in Denver Wednesday to talk to executives and shareholders about the reality faced by workers who clean Target stores. CTUL has been working to organize area retail janitors for three years. The workers center does not have the same rights as a union to enforce labor contracts or bargain collectively, but one local labor leader said the group is better than traditional unions at organizing isolated retail store janitors. CTUL hopes that their organizing will eventually result in workers’ gaining representation by the local Service Employees International Union. The union represents local commercial building janitors and is a partner of CTUL. The group is one of a proliferating number of non-union labor groups around the United States, which are organizing Walmart employees, restaurant workers, taxi drivers, farm laborers and domestic workers. On June 7, Walmart workers finished a nearly two-week-long strike organized by OUR Walmart. They, too, demanded an end to retaliation against worker-activists. “Recently workers have been reporting more and more examples of how the contractors are retaliating against them,” says CTUL organizer Brian Payne. He says retaliation can range from subtle changes in managers’ treatment of janitors to workers being fired or suspended. Flores is nervous about what will happen when she returns to work later this week, but Payne says she should have nothing to fear. Since the janitors are protesting illegal retaliation by employers, he says the action counts as an “unfair labor practices strike,” which labor law protects. Employers are legally required to allow this class of strikers to return to work without discipline or fear of being fired. 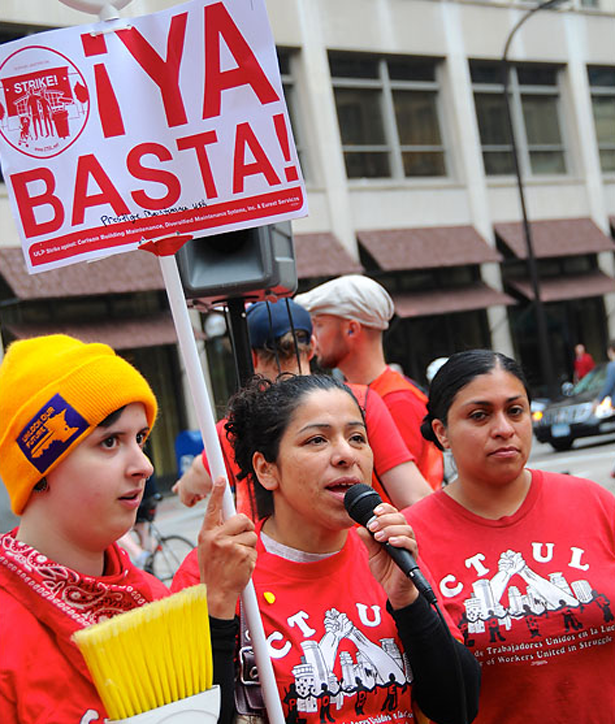 The intimidation experienced by workers risks discouraging them from fighting for CTUL’s ultimate goal: a living wage and benefits for all retail janitors, guaranteed by a union-negotiated labor contract. Payne says most of the janitors with whom he works earn around $8.50 per hour, with few or no benefits. The low pay rate explains the short length of the strike. Just barely scraping by, most retail janitors can’t afford to miss more than a couple days of work. Holding single-day strikes is a strategy that’s also been used by Walmart and fast food workers. Union-protected janitors who clean the office buildings across the street from the downtown Minneapolis Target store earn $13.92 to start, with sick leave, vacation days and healthcare. Their union, SEIU Local 26, hopes to eventually represent CTUL workers. In fact, the contractor Anisca Floor Maintenance recently signed an agreement with SEIU to allow its employees to join without fear of retaliation. SEIU organizer Steve Payne (Brian’s brother) says CTUL’s model of developing individual workers’ self-advocacy skills and knowledge of labor laws makes the workers center better suited than SEIU to organize the janitors, who largely work in isolation. CTUL was founded seven years ago as a service center supporting victims of wage theft. The volume of complaints they heard against cleaning contractors convinced the organization to start the Campaign for Justice in Retail Cleaning in spring 2010. Payne says Target’s contract bidding process encourages companies to underpay janitors. It’s a race to the bottom, where cleaners win contracts by underbidding one another. “The result is that the worst companies end up coming in,” he says. The list of complaints logged against the contractors is lengthy. In February, Diversified Maintenance settled a class action lawsuit accusing the company of forcing janitors to use “ghost” time cards to avoid payment of overtime wages. The company denied wrongdoing, saying that it was the work of a “rogue” manager. The Nation reported in January that twenty-five Minnesota workers had filed safety concerns with OSHA. Workers reported that retailers regularly locked them inside stores while they cleaned at night and that contractors did not supply proper safety training and equipment to protect against dangerous cleaning chemicals. Since the February strike, CTUL has noted improvements in worker conditions. These days wage theft complaints against cleaning contractors are rare. Payne has heard reports that workers are receiving modest pay raises. But he says no gains are guaranteed without a labor contract and a union. Flores has gloves now, but thin ones. Her cleaning chemicals still sometimes seep through the material and lacerate her skin. Follow Josh Eidelson’s blogging on the rash of strikes among non-unionized retail and food service workers. Alleen BrownAlleen Brown is a Minneapolis-based writer. Her work has been published in In These Times, MinnPost.com and the Twin Cities Daily Planet.